Last week we interviewed Andrej Mirovic, a former Student Value Path‘s participant, who did a summer internship experience at Schroder in Milan. Tell us something about your summer internship. “First of all, I would say that my experience at Schroders was the first real work experience of my life. Previously I did a sort of training course at the Central Bank of Montenegro but it wasn’t a real job. While in Schroders I had the chance, for the first time, to work in team: I backed up the work of Schroders’ employees and in this way I got a good idea of what the company does every day. The thing I loved the most about my internship experience was the feeling of real involvement in the team. There was a specific hierarchical order either by age or role, but I was very often in contact with senior managers and had the chance to learn from people with huge experience. For example, one day I was invited with the other interns to attend a very important meeting with Schroders’ top management: I really felt part of the whole and I can say that, up to now, I haven’t found yet another company which has this great consideration as for interns. During those 3 months in Milan I was able to improve my Italian. At the beginning it was quite challenging, because I was not used to it and I had to face a culture very different from mine, but in the end I was able to overcome this barrier. Furthermore, thanks to Career Paths, I had the opportunity to attend seminars and lectures about business and other interesting topics”. Which skills do you think you developed thanks to this internship? “At Schroders, for the first time, I started to understand how to behave in a work environment. I learned how to write formal emails, how to deal with managers and supervisors, how to prepare presentations and to make financial analysis of funds. Every day I had to use the financial provider Bloomberg so in the end I also improved my technical skills. I arrived at Schroders exactly one week before Brexit was announced, so it was really interesting as I had the chance to see how a company manages a time of crisis. In this situation I was able to improve my communicational and relational skills which was pivotal to my working in a group”. How do you think you employed these skills in your following internship experience? 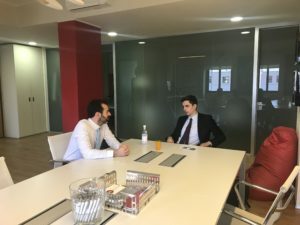 “After my experience at Schroders I did a 6 months internship here in Milan at Glaxosmithkline Consumer Healthcare where, I dare say, I improved my existing skills and those learned at Schroders. At Glaxo I had to prepare a lot of reports and presentations, but I didn’t have any difficulties and I easily handled the required tools. Furthermore, I had to deal with my supervisor every day but I was confident about my relational skills, because I had bettered them. Working in Schroder also taught me to be organised, precise and to the point, such as keeping a things-to-do agenda to be more efficient; this proved to be a winning strategy when working at Glaxosmithkline”. “Currently I am working at Be Consulting, another company here in Milan. My job is completely different from the one in Schroders. At the beginning I started looking for a job to match my interests, as in Schroders, but I couldn’t find anything. So I decided to diversify my search and I was offered this job. I am very happy with it!”. What do you suggest to a student who wants to experience a summer internship? “I strongly advise this experience. It is educational either from a professional and a personal point of view. You start to understand what working really means and you have the chance to try something that maybe you find interesting at the beginning, but then you realise it is not your future path”.